A few nights ago I was scrolling through Netflix, trying to find something new to grab my attention for an hour or two. I briefly paused under the banner of “Critically Acclaimed TV Shows,” which included among others Netflix’s Original shows Fauda and Glow, because I saw something that reminded me of my adolescence—Gilmore Girls. No, I wasn’t born to a single-mother in picturesque New England, I was born and raised in Zurich, Switzerland. But I have a sentimental connection to Gilmore Girls nonetheless—Rory and Lorelai entertained me many an afternoon (and into the early evening) after coming home from school. A native Swiss television industry with compelling, original programming was practically nonexistent when I was coming of age in the late 1990s and early 2000s. Swiss cable packages would mainly include German and Austrian channels, as well as the Swiss national public broadcaster, all of which would schedule daily episodes of successful, and sometimes less successful, American sitcoms, cartoons, and teenage dramedies like Malcolm in the Middle, Sabrina the Teenage Witch, The Simpsons, Friends, The Nanny, Dawson’s Creek, and of course, Gilmore Girls, to fill the late-afternoon programming slots. Initially, I watched the dubbed versions that aired on Austrian and German channels, but eventually I ceded to my desire to hear the characters’ true voices and switched to watching these shows on the Swiss public broadcaster, which showed them in English with German subtitles. I don’t think I had a concept of a “season” of television until I was in high school. The shows I liked were on every day without missing a beat, and when they weren’t another seemingly endless block of episodes of a different show would fill the void. Finally, the proliferation of DVD boxsets introduced me to the standard structure for TV shows: 24, 20-minute episodes per season for comedies, while dramas weighed in at 40 minutes an episode. While there were some premium cable outliers like HBO’s The Sopranos, or The Wire, for the most part that was the tried and true formula—for American TV, at any rate. Case in point: In 2004, the American network NBC was desperately searching for a new sitcom that could fill the gaping void that the ratings-monster Friends had left behind. The network decided to continue with a then-burgeoning trend of culturally and narratively adapting British television for an American audience, and it settled on The Office. The original British version—produced by Stephen Merchant and Ricky Gervais—consisted of two 6-episode seasons (each episode being 45 minutes). The NBC version, headlined by Steve Carell, followed the traditional American format, and ran for a total of 201 22-minute episodes over nine seasons. In case you were wondering, NBC had no interest in acquiring the rights to the original show; the British The Office was only broadcast on BBC America. In part, this tradition of remaking foreign shows has allowed tens of millions of Americans—maybe even an overwhelming majority—to grow up consuming entertainment in their own language, with their own cultural references and context reflected back to them, ignorant perhaps of a show’s original foreign origins. In Switzerland however, the slew of U.S. programming slowed down only in the evenings, when networks would sprinkle in original content, news broadcasts , and game shows. I didn’t understand why at the time, I just wanted another episode of Futurama. It was only later that I discovered the reason: the European Union’s Audiovisual Media Services Directive (AMSD). The AMSD was the distilled product of several programs the European Union started in the early 1980s (some countries having had quota systems in place since the mid-1960s) to protect homegrown entertainment products, like television, movies and music, all in the name of protecting national culture, or European cultural diversity. The law imposed a European content quota for broadcasters, radio stations and movie theatres, though its critics charge that rather than producing cultural diversity, it mainly protects local production industries and effectively ‘subsidizes’ lower quality, less viable content, often dubbed “quota quickies,” produced mainly to meet the content quotas. In the last few years however, the entertainment landscape—especially television—has changed. Increasing numbers of people are choosing to opt out of traditional TV plans, foregoing cable for on-demand and online streaming alternatives. Around 14% of U.S. households have “cut the cord” in favor of online services like Netflix, Amazon Prime, Hulu, and others so far. Though popular belief might suggest that the biggest demographic of cord-cutters are under 35s, it’s actually not just a Millennial or Generation Z phenomenon; 40% of those who have abandoned TV are between the ages of 35 and 54. This trend managed to evade the E.U.’s regulatory arm until this spring, when the European Commission finally threw down the gauntlet, extending content quotas to Netflix and its competitors, mandating that streaming and on-demand services offer at least 30% European content. The consequences of what I’ll call the "Netflix effect" are going to be significant. Yes, I do mean Netflix in particular, and not only because Amazon Prime is already more or less in compliance with those quotas, as a source at Amazon familiar with the company’s acquisition policies told me (Netflix is at 20%, as its CEO Reed Hastings recently revealed at an industry event), but because of the difference in content strategies between Netflix and its “prime” competitor. While Amazon operates under a royalty model, much like Spotify, with very little content curation or original content creation, Netflix operates much more like a traditional broadcaster. An acquisition team scouts titles Netflix wants to have on its platform, and content partners are paid hefty license fees for a specific duration. (From personal experience, I can divulge that even foreign language documentaries can easily command a five-figure license fee from Netflix for 24 months of streaming availability). The problem with this for Netflix is that it’s expensive and results in a fractured country-by-country experience for subscribers. If Netflix wants subscribers in Uzbekistan and Bélize to have access to the same shows, it needs to acquire worldwide rights, which is often difficult and prohibitively expensive. 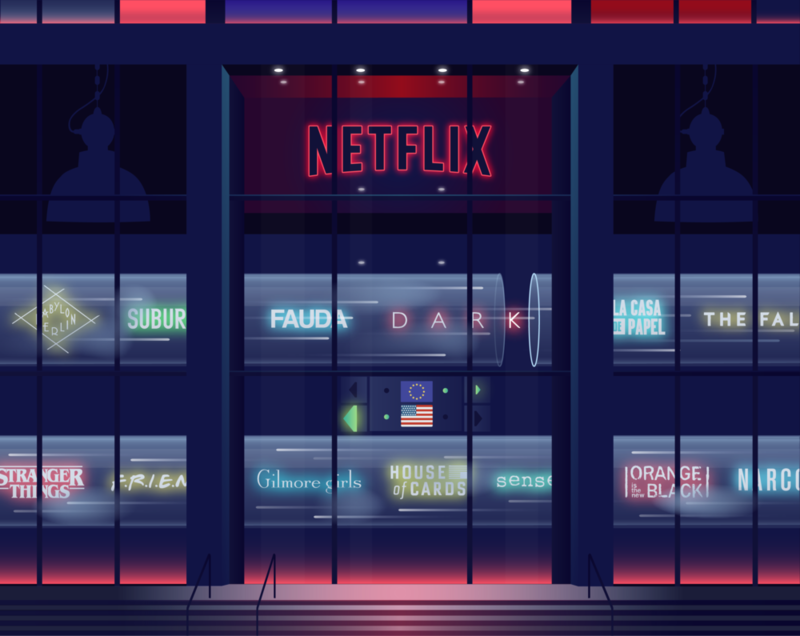 That dilemma has lead Netflix to go all in on Netflix Originals—content produced and/or commissioned by the company itself, sometimes by outside studios for Netflix, like House of Cards, Narcos, and Orange is the New Black, sometimes in-house, like the popular 80’s themed thriller Stranger Things. This way the platform holds worldwide rights in perpetuity. In order to comply with the E.U.’s 30% European content quota and given its strategy of betting big on original productions, Netflix will have to invest heavily into European productions that will be available worldwide. According to sources at Netflix, the company is going to focus more on TV shows than on movies, because their greater collective hours of content will count more heavily in the “quota game.” The European TV blitz has already begun: earlier this year Netflix secured the rights to a number of original European TV shows, like the German period piece Babylon Berlin and horror-thriller Dark, as well as the Italian crime syndicate show Suburra and the Israeli thriller Fauda, which is produced by French and German studios. In fact, just two weeks after the E.U. quotas were announced, Netflix gave the green light to ten new European T.V. shows and acquired production facilities in France, Spain, Germany, and the Netherlands. Each of these new projects will have an immediate potential audience of 125 million Netflix subscribers worldwide. Though the company doesn’t divulge ratings for a title’s performance on its platform, so far its existing non-English language original shows have been given the green light for multiple seasons. Shows like Fauda, Dark, and La Casa de Papel have become well-known cultural phenomena well beyond their language barriers. It is not too far-fetched to think that at some point in the near future, a European TV show could be one of the most popular shows in the world. Regardless, the influence of European productions on the American market is undeniable; from HBO to Showtime to AMC, channels outside of the big four traditional broadcasters have found European-style storytelling a more compelling format for highly acclaimed shows like Mad Men, Breaking Bad, Game of Thrones, or The Affair. Most premium cable and Netflix shows have adopted shorter seasons and episodes that run nearly a full hour. Procedurals like the CSI or Law and Order franchises remain popular, but have to cede the water cooler conversations, newspaper columns and podcast episodes to more inventive, daring and experimental television. Entertainment—be it music, movies or television—has long been considered a successful tool of soft power; a relatively easy way for the United States to export its culture and norms to the rest of the world, to spread Western ideas about democracy and open societies to far flung places without the cost of slow moving diplomacy or, worse, military intervention. The Netflix effect will likely broaden this soft power lane, and in some cases even inverse the directional flow across the Atlantic, as consumers, particularly in the U.S., gain exposure to new points of view on history, conflict, human relationships and what an ideal society looks like. The democratization of entertainment on a global scale will give us a fascinating and promising chance to learn from each other—even if we have to read subtitles in the process.